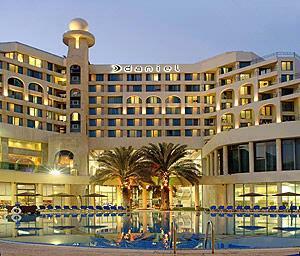 Tamares is proud to present its newest success, the Daniel Dead Sea Hotel. Float on the world's saltiest water and enjoy a healing sulphur bath, or a relaxing treatment at the luxurious spa. Then get geared up for fun at the Hotel's own bowling alley, a cold beer at the pub, or a sumptuous meal at the restaurant. With endless pleasures inside and the Dead Sea on your doorstep, you'll never want to leave the Daniel Hotel. The Hotel caters for everyone, with swimming pools, a conference center, a disco and a health club where a gym, sauna, whirlpool and steam room all await you. And all of this with a stunning desert view across the still waters of the Dead Sea. 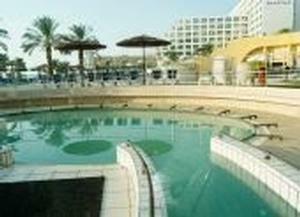 The Daniel Dead Sea Hotel has 302 luxury rooms, of which 12 are lavish suites. Each room enjoys views of the desert and the Dead Sea, and warm touches such as fresh fruit bowls create a relaxed, resort feel. Cosy and comfortable, rooms are floored with locally produced ceramic tiles, perfect for the desert climate. A wide range of sleeping options is available to make every kind of holiday great. Extra beds and bedding for families and children or additional guests are easily arranged A mini-bar and coffee kit ensure your needs are met at any time of the day or night while color television with an in-house movie channel provides varied entertainment for all age groups. 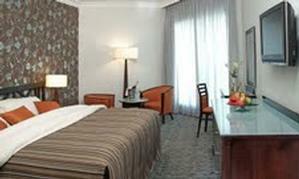 Direct-dial telephones in the rooms allow easy external calls, and provide a wake-up service and private voice mail. 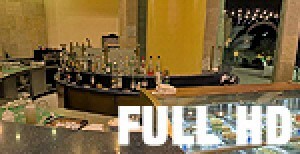 On Club Level, wireless internet access and work desks are also provided. Bathrooms feature fine quality amenities as well as convenient details such as a hairdryer and more. Situated at the world's lowest point, on the shores of the extraordinary Dead Sea, the Daniel Dead Sea Hotel is just a short distance from ancient biblical and historical sites such as the stronghold of Massada.